At St. Andrew’s Episcopal Academy, our Primary division believes that, in these formative years, our students thrive in a setting which emphasizes whole body teaching. Our curriculum focuses on enhancing all areas of development in a child including social, emotional, cognitive and physical growth. Classroom teachers incorporate a variety of multi-sensory activities aligned to the weekly target skills in Language Arts, Science, Math and Social Studies to ensure students are actively engaged in the entire learning process. Our primary grades use HMH Journeys, Go Math and Science Fusion. The curriculum has been carefully designed to offer a progression of skill development, incorporating a range of teaching strategies and methods. Each quarter, students are assessed on a variety of skills that reflect the student’s progress, noting areas of strength and weakness. In addition to parent-teacher conferences, teachers are readily available to meet with parents and students to provide updates on a student’s progress. The use of technology is integrated into every subject area. The infusion of online resources, apps, videos, games, tutorials, e-texts, and other digital curricular assets provides a wide range of supplemental engaging materials for each subject area. Primary students also attend weekly elective classes, which include Music, Spanish, Physical Education, Christian Education and Art, that compliment our curriculum. 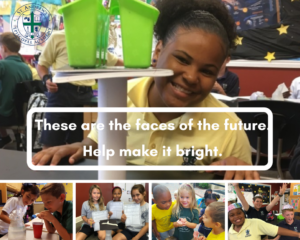 At St. Andrew’s Episcopal Academy, our Elementary division believes in promoting strong academic expectations through a blend of print, inquiry and a variety of digital experiences. Students will apply the basic skills that were learned throughout the Primary grade, thus building vital skills on top of their pre-existing knowledge and allowing for higher-order thinking to occur. Through instruction in Science, Math, Reading and Writing, our elementary educators incorporate various S.T.E.A.M. projects in the classroom to allow for whole body teaching to continue through the elementary grades. Our elementary grades use HMH Journeys, McGraw-Hill My Math and HMH Science Fusion. The curriculum has been carefully designed to offer a progression of skill development, incorporating a range of teaching strategies and methods. Each quarter, students are assessed on a variety of proficiencies that reflect the student’s progress, noting areas of strength and areas for improvement. In addition to parent-teacher conferences, teachers are readily available to meet with parents and students to provide updates on a student’s progress. Elementary students also attend weekly elective classes, which include Music, Spanish, Physical Education, Christian Education and Art.